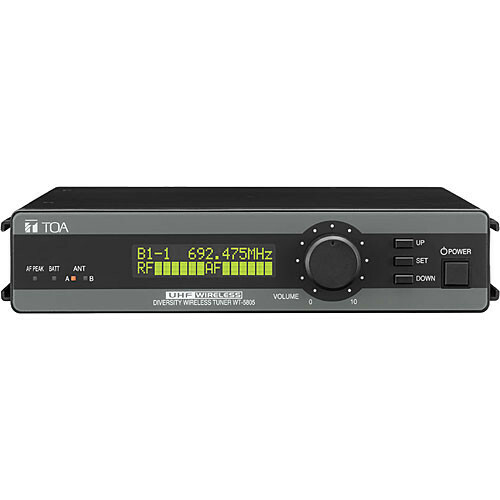 The TOA WT5805 is a wireless 64-channel UHF space-diversity receiver designed for use with the TOA 5000 series wireless microphone system. The receiver features a half-rack space or surface mounted unit that features 64 UHF selectable frequencies, automatic channel detection, radio frequency scan (RF check), an intuitive control panel and a large LCD. Balanced XLR and unbalanced 1/4" phone connections are located on the rear. BNC antenna inputs and outputs are provided, and the receiver may be used for distributing radio signal to additional receivers. Box Dimensions (LxWxH) 14.0 x 10.0 x 3.0"
WT-5805 Wireless 64-Channel UHF Space-Diversity Receiver (Band F01: 636 to 666) is rated 3.0 out of 5 by 2. Rated 5 out of 5 by ChanBarker from Excellent Product I use this product about 6 hrs per week with shows at different venues. I have never had dropped signal even when the venue has their own wireless systems. I highly recommend this product.